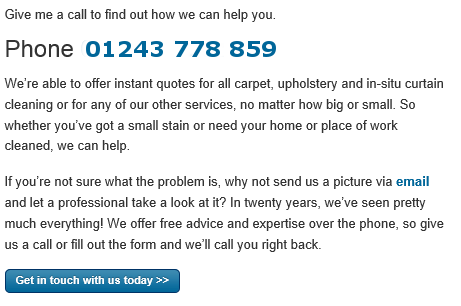 Apple Clean are local carpet, curtain and upholstery cleaning professionals in the Chichester area. 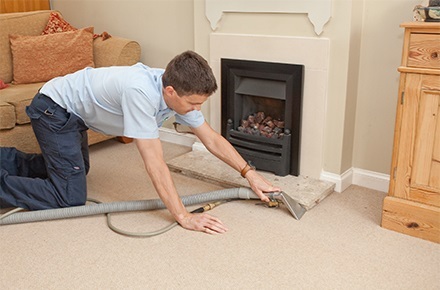 We’ve been providing a wide range of cleaning services in Chichester for 25+ years. Whether you need unbeatable stain removal, in-situ curtain cleaning or carpeting cleaning services for your home or commercial carpet cleaning for your business, contact Apple Clean today for a personal service that’s second to none. Hi, I’m Jonathan and for more than 25 years I’ve been supplying carpet, curtain and many other cleaning services to homes and businesses in Chichester and the surrounding area in West Sussex. I have always felt very strongly that the best way to succeed with a local business is to offer an exceptional service that is both professional and personal, providing excellent customer service and achieving brilliant cleaning results. Call me today and I’ll explain what we can do for you, giving honest and realistic advice as well as an instant no-obligation quote. 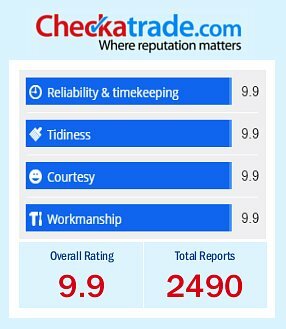 At Apple Clean we are proud members of the Checkatrade, a directory of recommended at trusted tradesmen who have been vetted and monitored and meet the highest standards of trading. Read certified and genuine reviews from past customers in the local Chichester area, or provide your own feedback. Apple Clean has over 2600 reviews and an average score of 9.89 out of 10! Give us a call us now on 01243 778 859 and find out more about our cleaning services for homes and businesses in Chichester and beyond. At Apple Clean, we continue to provide expert carpet and fabric cleaning services to residential and commercial properties in Chichester and across West Sussex. Our customers are highly satisfied with the result of our specialist cleaning methods, carried out by our professional, experienced operatives. We are thrilled with the high levels of positive feedback we keep receiving from satisfied clients and always endeavour to maintain our exemplary record in the cleaning industry. Even if you require specialist fabric cleaning, including leather cleaning or flameproofing, you can trust Apple Clean to have a fully qualified team and the best possible equipment to help with whatever your needs are. 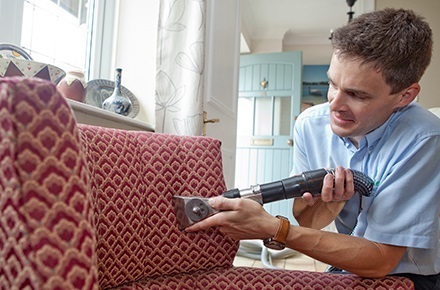 If you’ve ever tried to remove a stain from a carpet of ridding upholstery fabric of dirt marks, you will know how frustrating it can be when you’re not sure of the correct cleaning method or don’t have the right equipment. You can even cause further unwanted damage to surrounding fabrics and furniture if you’re not sure about how to go about the cleaning process. That’s where Apple Clean come in. While we use the latest high tech industrial equipment so that we can specialise carpet cleaning, we can also provide outstanding services when it comes to stain removal, in-situ curtain cleaning and specialist fabric cleaning. Our expert cleaning methods have highly effective results. 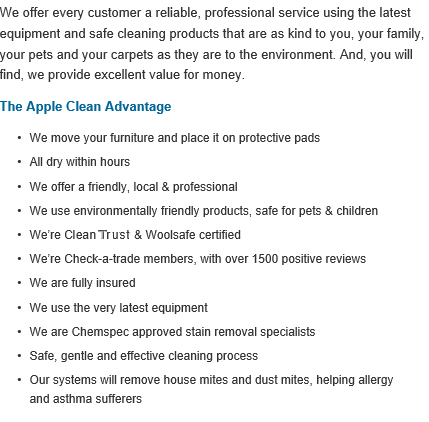 If you’re looking for the most reliable carpet cleaners Chichester has to offer, call Apple Clean today and watch us bring your fabrics back to life.